I'm a big fan of, and subscribe to, Milk Decoration magazine and love reading their website as often as I get a chance. I came by so many great stories there this morning over breakfast but one stood out because I've been getting press release after press release lately for Nathalie Lete. Milk covered her too so I thought I needed to share her latest work because apparently she's all the rage - again! Nathalie is inspired by American artist Kiki Smith, William Morris - "English textile designer, poet, novelist, translator, and socialist activist. Associated with the British Arts and Crafts Movement, he was a major contributor to the revival of traditional British textile arts and methods of production", Bernard Palissy -"French Huguenot potter, hydraulics engineer and craftsman, famous for having struggled for sixteen years to imitate Chinese porcelain", and American Folk Art. 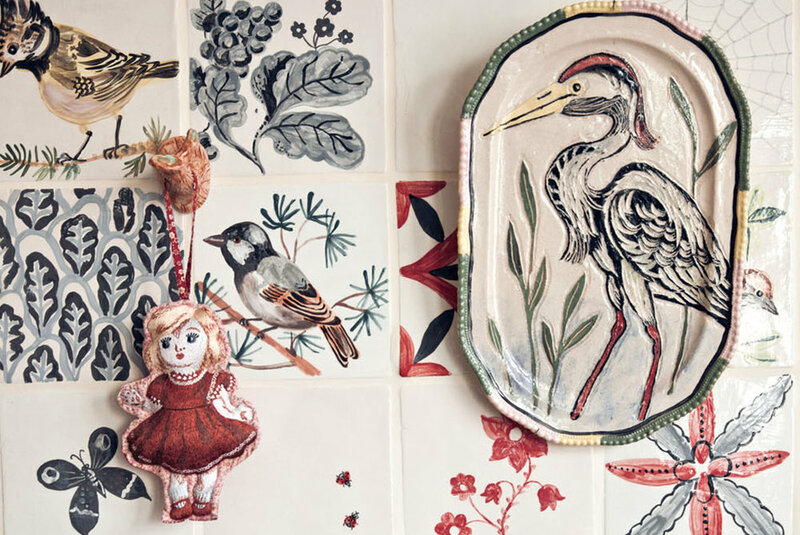 Rugs, chairs, tiles, pillows, prints, dolls, hangers, wooden stools, wallpaper, glassware, trays, lamps, wall hooks, clothing, tea towels and plates, ceramics (my favorites), wall stickers, stools and tables, silk scarves, there is nothing her imaginative work hasn't touched.